Some foods must be tried because ... well, just because. We had grazed to beyond bursting at a great little market on the edge of Kuala Lumpur's Golden Triangle, and were on our way out when we were confronted with the Winson Berger. Soft squishy buns, waxed pork, chicken floss. Initially, it's not tempting. But the Winson Berger has so many things going in its favor - the jerry-rigged portable prep station lashed to the back of a motorcycle, the funky hand-lettered sign, the jowly vendor. Plus, there are customers. People are queuing for the Winson Berger. Two people are, anyway. The grill's a nice touch. A bit of char can kick even the softest, squoogiest of breads up a notch. Winson is generous with the waxed meat, which has had it's own turn on the barbie. It's the first time I've eaten chicken floss voluntarily. I generally don't care for meat that's been processed to achieve the texture of cotton candy. But I want to experience a full-on Winson Berger, so I go with it. It's surprisingly good. The bland soft bun and salty, chewy waxed meat work well together, the cucumber is fresh and crispy. Next time (yes, I think there just may be a next time!) I think I'll tweak my Winson Berger a little: leave off the floss, request double the amount of cucumbers and waxed meat, and skip the overly sweet chili sauce. But if nothing else, the Winson Berger deserves a place in the pantheon of KL original eats. 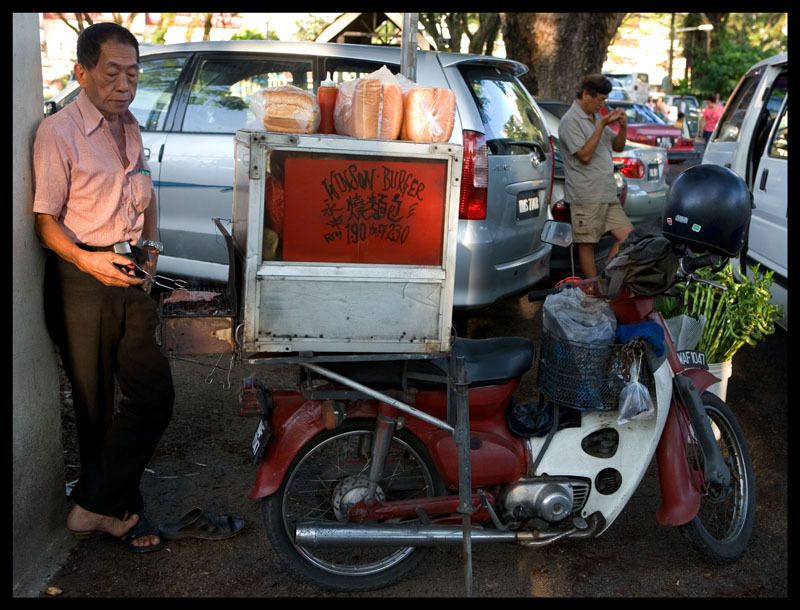 Winson Berger, outside the entrance to Imbi Market (behind Jalan Imbi), downtown Kuala Lumpur. Most mornings (but not Sundays). "Some foods must be tried because ... well, just because." That is advice to live by. This is by far my favourite foodblog! You guys really do South-East Asian food justice, and those pictures are simply gorgeous. Thanks! This is something that many Chinese enjoy eating. At a time when things in KL are so expensive and the ringgit seems to shrink by the day - sneeze, and that's RM10 - your first two photographs truly stopped me in my tracks. Dried meat sandwich is my favorite when I was a kid. I remembered there is a slightly different version in the Petaling street area. 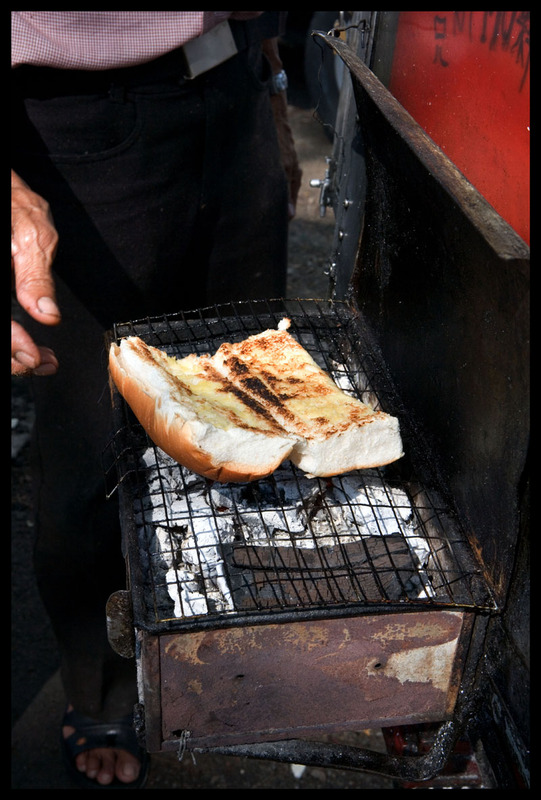 The vendor would add a light soy flavor sauce on the bread. It was really good. I am wondering if Winson guy is breaking even. I paid about $1.00 for this sandwich 25 years ago. Food and petrol prices have gone up so much. Great post and pictures. i remember this..a fellow used to sell the same stuff in the cheras market..
a of course, the converse applies sometimes, as well. bayi - so it seems, judging by the number of comments. Have even gotten a few emails about this post. Seems to have struck a nostalgic chord. mycookinghut - so it seems! Many folks remember the Winson Berger or a variation thereof from their childhood. ELE - sometimes the biggest pleasures are the cheapest. 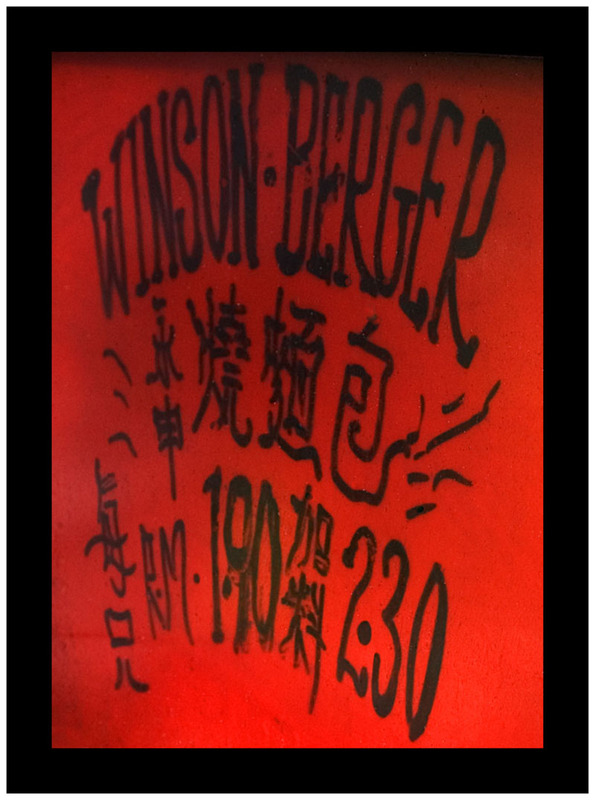 Meng - thanks for sharing your memories of a variation on the Winson Berger. We wondered the same thing - how can this guy be making a living? lotsof - haven't been to the cheras market. Wonder if he is still there? Is the waxed meat the same as bak kwa? That reminds me of my childhood comfort food. 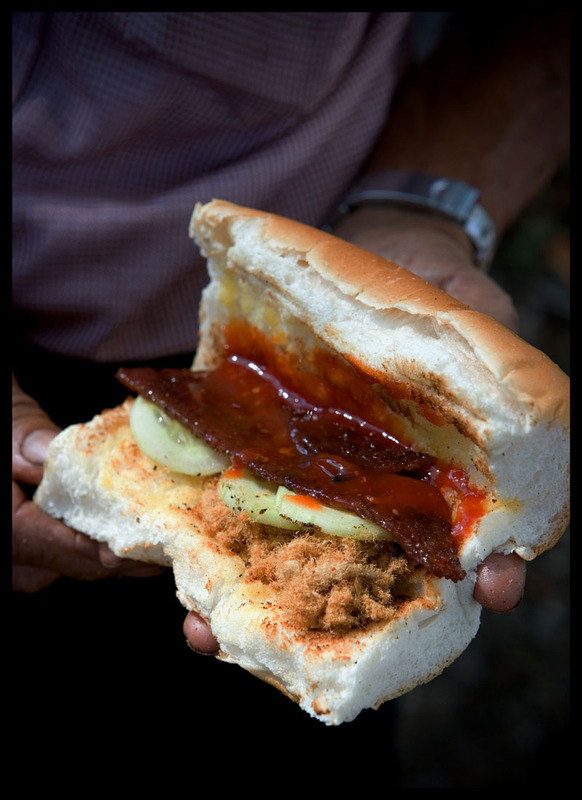 Whenever I have enough money to buy Dried Meat & Meat Floss Sandwich, I will salivate while the bread and meat being grilled. Nate 2.0 - Waxed meat is bak kwa. chicken processed to the texture of cotton candy? i can't even imagine it, and yet your photos make it look delicious! This is something that I really enjoy eating since young. Used to have it for breakfast. I guess many Malaysians love it. Robyn and Dave thank you for the wonderful blog and picture it was inspiring for me. We ( me and my husband) been to KL so many times for work and others ( shopping :P ) when we live in Jakarta. Now that we back to the state your blog is just like water for my thirst of asian food specially Indonesian since I am one of them :P and my husband love it too specially my specialty beef rendang not to spicy for his foreign taste. I hope we can go back this year to Indonesia and perhaps KL ( if we are not so busy going to school and work ) and i will take a note from your blog!!! i trust your taste ...:P.. and Dave i read your blog too about your love for film I LOVE IT TOO... ( i love to take apicture with polaroid instant film too ) my husband said I'm old fashioned. Keep up the good work guys you convert me to this delightful blog . There are 2 types of this BBQ-ed meat. One is minced pork and then compacted before being BBQ-ed. The other is tougher, being sliced before the BBQ process. The latter has strands of meat intact according to the grain and many people tend to enjoy this. The minced version is enjoyed by those who do not like tough meat. And good to hear the Winson Beger turned out okay. Those scenarios can go either way, and I have been on the wrong end before as well! =) Thanks for sharing! Nate - good question. I guess some googling is in order. Anyone care to jump in here - bayi? katy - I'm still not entirely sold on chicken (or pork) floss ... but I will allow that there is a time and a place (such as on a Winson Berger). sugar bean - yes, it seems to be a little-known (to non-Malaysians) Malaysian favorite. Hi nova - thanks for your comments and welcome to EatingAsia! We are hoping to get to Jakarta in the next few months. bayi - another authoritative, informative comment. Thank you! I think if I ate that I'd be scared of being laid up for about a month afterwards. While I love Asian food of all sorts, that doesn't look like one of the sorts I'm afraid. But I'm enjoying reading your blog and I've decided to tag you (see my latest post). wow, your pictures make us want to hop on a plane and fly over there right now! Until we get on over there, we're just gonna be having breakfast...lunch...and dinner on your blog! Thanks for a great meal! Great blog but has the Winson Berger finished you off? Trig - sometimes you just gotta ignore what your head tells you and dive in with your stomach. White On Rice - thanks very much and welcome to EatingAsia! Paul - touche. And apologies (to you and others). We survived the Winson Berger but deadlines have nearly done us in. We should be back on track with the next post (which just went up). It's funny to hear you call it "waxed meat" but I guess it does look and taste a little like it. I've always known it as bakwa or deng deng (an Indonesian version). 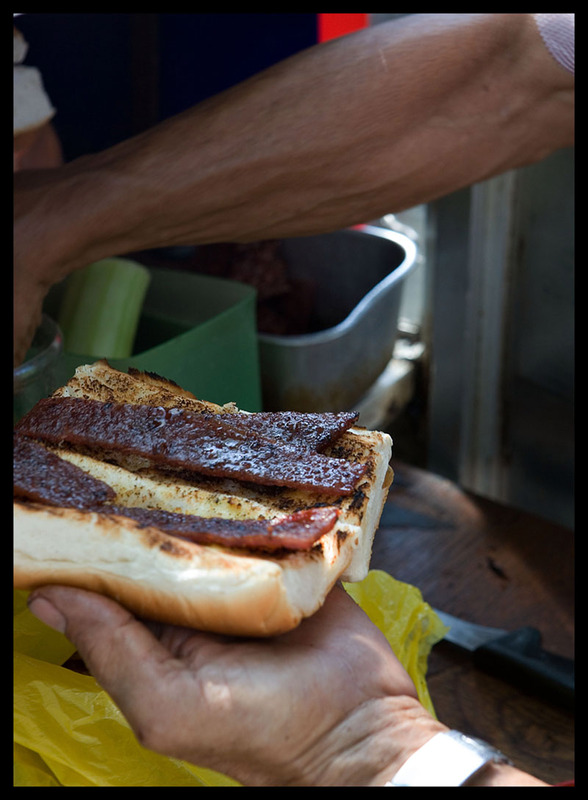 It was one of my favorites growing up in Singapore but I've never had it in a bun with chicken floss AND chili sauce! YUM!